Softcover, Cover has light wear/Mild tanned. Good solid copy, mild to moderate reading/age wear, no DJ if issued, may have some light markings or exowner inscription. We take great pride in accurately describing the condition of our books and media, ship within 48 hours, and offer a 100% money back guarantee. Good. 0140144579 USED US EDITION BOOK-Items do not contain any supplemental materials even if listed in the title. Books have stickers, highlighting, writing, or tape used to mask instruct edition. Pages and Cover may have creases, scratches, or slight water damage. Consumable items are filled out and completed. We ship out most orders within 1 business day with tracking. Good. 0140144579 Moderate edge wear. Binding good. May have marking in text. Dust jacket included if issued with one. We sometimes source from libraries. We ship in recyclable American-made mailers. 100% money-back guarantee on all orders. 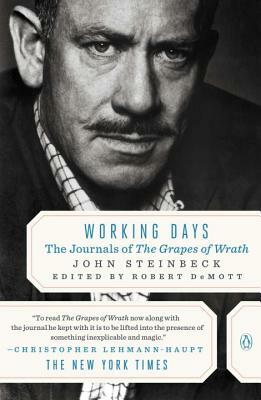 The Harvest Gypsies: On the Road to the "Grapes of Wrath"
This book is a representative of Steinbeck's writings, doubts, struggles and triumphs. It offers insight into his writing process and general attitudes. Well documented and offers excellent critical background.